"Avacintya means beyond our conception. Even though you are able to go in high speed, and for so many years, still, Krishna remains avacintya-tattva. Nobody can find out where is Krishna's abode, Goloka Vrndavana. Therefore the Mayavadis, in desperate frustration, they say that Krishna is impersonal, because they want to approach Krishna by mundane activities -- by mental exercise, mental gymnastic. Krishna is not available in that way. Krishna is available only to His devotees. Krishna is the property of His devotee." "Yes, Krishna is never approached directly. Krishna is approached through His bonafide servitors. He says that, 'Carrying out the order of My pure devotee is greater than carrying out that directly given by Me.' In this connection, I may inform you that you try your best to serve Krishna under the direction of your Spiritual Master and Krishna will surely help you in all respects." "The whole world is full of fanatics and atheist classes of men, so sometimes we have to face such difficulties. But this is all tapasya. Without tapasya, nobody can approach Krishna. So preachers who boldly face all kinds of difficulties are considered to be under tapasya, and Krishna takes note of such tapasya of the devotee, and the devotee is recognized by Him." "In the Chaitanya Charitamrta it is said that one is successful in Krishna consciousness by the combined Mercy of the Spiritual Master and Krishna. By the Mercy of Krishna we come in contact with a bona fide Spiritual Master and by the Mercy of a bona fide Spiritual Master we can approach Krishna. So, both of Them are cause and effect of either of Them. Krishna is the original Spiritual Master known as Chaitya Guru and He manifests Himself as the Instructor Spiritual Master. So this principle of following Krishna and Guru simultaneously is the secret of success, and if you follow this policy in the chain of disciplic succession than there is no doubt about your final achievement." "Thank you very much for your kind appreciation of our Krsna Consciousness Movement. You are having some doubts whether or not the mass of people will be able to appreciate Krsna Consciousness. Yes, it is a fact that most people cannot approach Krsna Consciousness. Just like a rare gem. Only a few men can purchase a rare emerald or diamond so similarly only a few men may actually be capable of grasping the importance of Krsna Consciousness. It is confirmed in the Bhagavad Gita VII, 3. If just .01% of the world's population becomes Krsna Conscious, the whole situation on the earth will change. Just see what has happened. I started alone in 1966 and in just seven years now we are three thousand, and it is growing more and more. So if the intelligent men of the world like yourself cooperate with this all-important mission of Caitanya Mahaprabhu, we can save the world from the state of misery and chaos that now prevails." "If you remain silent, never ask 'Why I am suffering?' then you are in the category of cats and dog. And when this inquiry begins, athato brahma jijnasa, then your human life begins. Otherwise you remain in the category of cats and dog. If you are satisfied with all miserable condition of life... In this country, the Western country, they present television, simply presenting problems. That's all. You have got experience. And they are making plans how to solve these problems. This is going on, whole day and night, and twenty-four hours. But actually, we are in a place with problems only. And intelligent man must inquire how to solve these problems. But they are inquiring, some of them, but not in the right channel. That should be in the... Just like Arjuna had problems: whether to fight or not to fight. So he approached Krishna. 'Krishna,' sisya te 'ham sadhi mam prapannam (BG 2.7): 'Krishna, I know that the problems, You can make solution.' Arjuna knew that 'Krishna is the Supreme Personality of Godhead, although He's acting as my friend.' 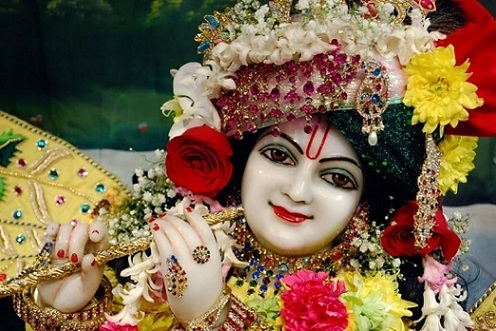 But he knew what Krishna is, and therefore he asked. So we are in face of so many problems. Why not approach Krishna? What is wrong there? And take Krishna's instruction and be happy. That is Krishna consciousness movement. We are opening centers everywhere. Take advantage of this movement and be happy." "For worshiping Krishna, there is no impediment. If you want to worship other demigod, there are so many things required. But for worshiping Krishna the poorest man in the world, any part of the world, he can offer his love, his offering to Krishna. Patram pupam phalam toyam yo me bhaktya prayacchati (BG 9.26). So real purpose of this Bhakti-rasamrta-sindhu by Rupa Gosvami, which we have translated by the name Nectar of Devotion, 'The Complete Science..., the Complete Science of Bhakti-yoga,' this is very important book of understanding how to become purified in devotional service, how to approach Krishna, how to satisfy Krishna. These things are described very nicely. And Krishna, being Supreme -- He's Supersoul -- we cannot approach with our material consciousness. Therefore the consciousness has to be changed. Then we can approach Krishna. That is Krishna consciousness movement." "Krishna explains in the 7th Chapter of B.G. that there are four classes of men who approach Him. There are millions of men in distress, or searching for money, or curious, or searching for knowledge, but only a few come to Krishna, and all of them are mahatma -- simply because they have come to the right place, Krishna. That is not by chance, but due to their past pious deeds. No one can approach Krishna without being purified, so this is the process. But no matter what the original motive, if one actually comes to Krishna he is mahatma. S.B. confirms it that if someone follows all the rules and regulations very nicely but doesn't come to Krishna it is useless, and similarly if someone comes to Krishna, even if he doesn't follow very nicely, he is perfect. Also, B.G. 7/19 says that the wise man after many births comes to know that Krishna is everything. So Krishna is central. So we may begin our chanting with some motive, but that is not the final stage. Love of Krishna is final, and how can we develop that unless we are chanting and thinking of Krishna? Some analyst or priest or lover may widen the consciousness from this to that, but only Krishna is without limit and therefore can widen the consciousness infinitely. That is the difference. The material world has varieties of this and that, this thing more than that thing, but only Krishna is without limit, and if we desire ananda, bliss unending, we must go to Krishna." "Guru and Krishna are two parallel lines on which the spiritual express runs very smoothly. In the Chaitanya Charitamrta it is said 'Guru Krsna prasade paya bhakti lata bija.' By the Grace of Guru one gets Krishna and by the Grace of Krishna one gets a bona fide Guru. Therefore Krishna consciousness means staunch faith both in Guru and Krishna. One minus the other is no good for the devotee. So your faith in the principles of devotion to Guru will certainly help you more and more Krishna. Do not ever try to approach Krishna directly. Anyone who talks of Krishna without service to Guru will not be successful. So your faith in Guru and Krishna simultaneously will help you to become crowned with success in the progressive march in Krishna consciousness. Do not be worried, be situated in the present aptitude and everything will be clear." "We cannot approach Krishna directly. We should approach through guru. Tasmad gurum prapadyeta jijnasuh sreya uttamam (SB 11.3.21). That is the injunction of the sastra, that one should approach the guru who can transfer the service from the disciple to the Supreme Person. So therefore the first offering is guru, vande gurun. Then guru creates many devotees. Guru's business is to canvass on behalf of Supreme Lord. That is guru's business. Krishna says, sarva-dharman parityajya mam ekam saranam vraja (BG 18.66), so, 'You give up all material en...' Sarva-dharman means in the material world we have created so many so-called duties. This is our material disease. People are interested in material engagements, and they have created different varieties of engagements. Sociology, Communism, and this 'ism,' that 'ism,' philanthropism, altruism, internationalism, nationalism -- many, many duties they have created. That is all material. Krishna, out of His causeless mercy He comes, He descends. Yada yada hi dharmasya glanir bhavati bharata (BG 4.7). Glanih, this is glanih. Human life is meant for one thing, athato brahma jijnasa, to inquire about the Supreme Absolute Truth. But instead of doing that, they have created so many 'isms.' That is their misfortune." "Those who are actually engaged in pure devotion, their senses are purified. Without purified senses, you cannot approach. With ordinary material senses, you cannot approach. Therefore we have to follow the regulative principles. Regulative principle and sinful activities. Otherwise, how we can approach Krishna? Yesam anta-gatam papam (BG 7.28). By the senses we commit so many sinful activities. Therefore sin... without being free from sinful activities, nobody can approach Krishna. Param brahma param dhama pavitram paramam bhavan (BG 10.12). Krishna is pavitram paramam, the supreme purified. So how we can approach Krishna without being purified? Therefore the four principle, regulative principles, must be followed. Otherwise, there is no chance of advancing. There is no chance. They are relatively, cooperatively helpful, chanting, but one must be willing that 'I must be purified to approach Krishna.' Otherwise he becomes sahajiya. So 'I am approaching Krishna. I can smoke bidi. I can take marijuana. I can...' No. Must be purified." "So there are twelve kinds of humors. Krishna can be accommodated with all the humors; therefore His name is Akhila-rasamrta-sindhu. Akhila-rasamrta-sindhu. Akhila means universal; rasa means mellow, humor; and the ocean. Just like if you try to find out water and if you go before the Pacific Ocean, oh, unlimited water. There is no comparison how much water is there. Similarly, if you want something and if you approach Krishna, you'll find unlimited supply, unlimited supply, just like ocean. Therefore it is said in the Bhagavad-gita, yam labdhva caparam labham manyate nadhikam tatah. If anyone can approach or gain that Supreme Absolute, then he will be satisfied and he will say, 'Oh, I have no more hankering. I have got everything complete, in full satisfaction.' Yam labdhva caparam labham manyate nadhikam tatah yasmin sthite. And if one is situated in that transcendental position, then what happens? Gurunapi duhkhena na vicalyate (BG 6.20-23) If there is very severe test of distress, he's not, I mean to say, faltering." "So we can enjoy Krishna's loving service in so many ways. Not only by the embrace of the gopis, but in the fight of Bhisma with Krishna and piercing His body with arrows. Therefore Krishna is akhila-rasamrta (CC Madhya 8.142). Any one rasa... There are twelve rasas, either primary rasa or secondary rasa. Any rasa, Krishna is ready to response to any rasa you want to deal with Krishna. That is Krishna's position. Kamat krodhad bhayat dvesat (SB 7.1.30). So what to speak of those who are loving. Just like Putana. Putana wanted to kill Krishna. That was his... that was her purpose. But when Putana was killed by sucking the breast and life both, then Putana was given the position of Krishna's mother. Because Krishna took it the bright side. Krishna thought that 'Whatever her intention may be, she came to Me just like a mother, and I sucked her breast. Therefore she is My mother.' She came as enemy, but Krishna did not take the inimical side. The motherly side. Tejiyasam na dosaya (SB 10.33.29). Similarly, the gopis, they came to Krishna out of lust, but out of lust they became purified. Just like the sun. The sun soaks the water from urinal, but sun is not polluted, but the urinal becomes sterilized. This is the process. So you try to approach Krishna some way or other. Then your life is successful. It doesn't matter. Kamat krodhad bhayad dvesat (SB 7.1.30). And what to speak of those who are constantly engaged in love with Krishna. Everything is love. As soon as you divert your attention to Krishna, that is love. It may be perverted. Just like Kamsa. Kamsa was always thinking of Krishna. Krishna... He was also Krishna conscious, but he was thinking in terms of killing Krishna, as enemy. So this is not bhakti. This is not anukula. Pratikula. But still, Krishna is so kind that Kamsa was also given liberation. This is the special kindness of Krishna. So any rasa. There are twelve rasas. Yena tena prakarena manah krsne nivesayet (Brs 1.2.4). That is the direction given by Srila Rupa Gosvami. 'Some way or other, fix up your mind in Krishna.' Then your life is successful. Some way or other." "Krishna is associated with Radharani, and She is associated with Her immediate companions like Lalita, Visakha, and others. So this is the process of offering respectful obeisances to the Deity. We cannot approach Radha-Krishna directly. We have to approach through the spiritual master, through the Gosvamis, through the associates of Lord Caitanya. Then we approach Radha, then Krishna. If one approaches Krishna through this channel of disciplic succession, his efforts becomes successful. Otherwise, if he wants to approach Krishna directly, it will be futile endeavor." "So, Sri Rupa Gosvami is first offering his respect, obeisances, to Sanatana Gosvami, who is his elder brother, at the same time guru. So we offer our respect in that way, vande rupa-sanatanau raghu-yugau sri-jiva-gopalakau (Sad-govamy-astaka). That is the way. We cannot jump over the highest authority directly. That is not possible. That is not the etiquette, or rules, regulation. We have to go. Caitanya Mahāprabhu says, gopi-bhartuh pada-kamalayor dasa-dasanudasah (CC Madhya 13.80). So He presents Himself as the servant of the servant of the servant of the servant of Krishna. So in order to become Krishna's servant, we have to become the servant of the servant of Krishna. So my Guru Maharaj is servant of Krishna, his guru, his guru is servant of Krishna, his guru is servant of Krishna. I am also servant of Krishna, but I have to approach through the other servants, not directly. That is not possible. Krishna will not accept that service. If one disrespects the parampara system, then he'll not be accepted by Krishna." "According to Vedic evidences, Caitanya Mahaprabhu is also Krishna. Krsna-varna tvisakrsna (SB 11.5.32). He belongs to the category of Krishna, but He is playing the part of a devotee of Krishna in order to teach us how to love Krishna, how to approach Krishna. As such, if we accept the process enunciated by Lord Caitanya, then it is very easy to approach Krishna. To approach Krishna is not very easy job, because Krishna says in the Bhagavad-gita, manusyanam sahasresu kascid yatati siddhaye yatatam api siddhanam (BG 7.3). Kotisv api maha-mune (SB 6.14.5). That is also stated in the Padma Purana, that muktanam api siddhanam. Those who are muktas... To become mukta, that is also difficult job. Out of many millions of jnanis, one becomes mukta, really liberated. And out of many millions of muktas, or liberated, kascid vetti mam tattvatah, kascid, not all, somebody may understand what is Krishna. So it is so difficult job. But Krishna is so kind that He has appeared as a devotee of Krishna, Lord Caitanya, and He is giving you the mercy, causeless mercy, so that you can understand Krishna very easily. That is the special gift of Caitanya Mahaprabhu." "When I am actually serious to have connection with Krishna, Krishna is sitting in everyone's heart, isvarah sarva-bhutanam hrd-dese 'rjuna tisthati (BG 18.61), so Krishna can understand. We cannot hide anything from Krishna. That is not possible. Because Krishna is sitting side by side, just like two birds, sitting side by side. One bird is eating the fruit of the tree; another bird is the witness. That is the Vedic version. So as soon as I become serious to know about Krishna, Krishna can understand, 'Now My friend is very serious.' So He will find out a bona fide guru for him. Therefore Caitanya Mahaprabhu says that guru-krsna-krpaya paya bhakti-lata-bija (CC Madhya 19.151). By the double mercy... Krishna's mercy and guru's mercy. If one is serious, Krishna is satisfied: 'Now he's serious about finding out, about knowing Me,' then Krishna gives him direction that 'Here is guru, My representative. You take shelter of him and you will get Me.' This is the way. That is explained in this... that by the grace of Krishna, that it is a fortunate person. Fortunate person means he must be sincere, serious to know about Krishna. That is fortunate. Because our misfortune has begun by forgetting Krishna. Krsna bhuliya jiva bhoga vancha kare (Prema-vivarta). When we desire to enjoy this material world, forgetting service of Krishna, that is the beginning of our misfortune. That is the beginning. Because as soon as I forget Krishna, that is the beginning of my misfortune. So in order to be..., in order to become again fortunate, I have to become Krishna conscious. That is the way. The same... By some way or other... Anadi-bahirmukha jiva krsna bhuli gela ataeva krsna maya... ataeva maya tare galila baddhiya (CC Madhya 20.117). Some way or other, we forgot Krishna. Unfortunate because we are, even we have got this opportunity of remembering Krishna, we are trying to avoid Him. We are bringing so many nonsense things: 'Why not this? Why not that? Why not...?' This is misfortune. Krishna says, sarva-dharman parityaja mam ekam saranam vraja (BG 18.66). But we are presenting, 'Why not this? Why not that? Why not this? Why not that?' This is our misfortune. Why? Krishna says, mam ekam. Why shall I try to put another alternative? Why? What is the reason? That is our misfortune. Krishna is offering the fortune: sarva-dharman parityaja mam ekam saranam vraja. This is fortune. But I'll not take that. Krishna says, 'Get up... Give up all other engagements. Simply take shelter of Me. I shall give you all protection.' But I don't believe Krishna; therefore it is my misfortune. This fortune, to become fortunate and misfortunate... Just like in English word, 'Man is the architect of his own fortune.' Is it not? 'Man is the architect of his own fortune.' But if you, as you are architect of your own fortune, you are architect of your own misfortune also. So if you don't accept Krishna's advice, then you must consider yourself unfortunate. We should be cautious: 'Why shall I become unfortunate? I must become fortunate.' So that, to become fortunate, is not very difficult thing. All these Krishna consciousness people, they are fortunate. They have taken Krishna's advice as it is, without any change. They're fortunate. And that is being manifested, that they are fortunate. So this is the process."